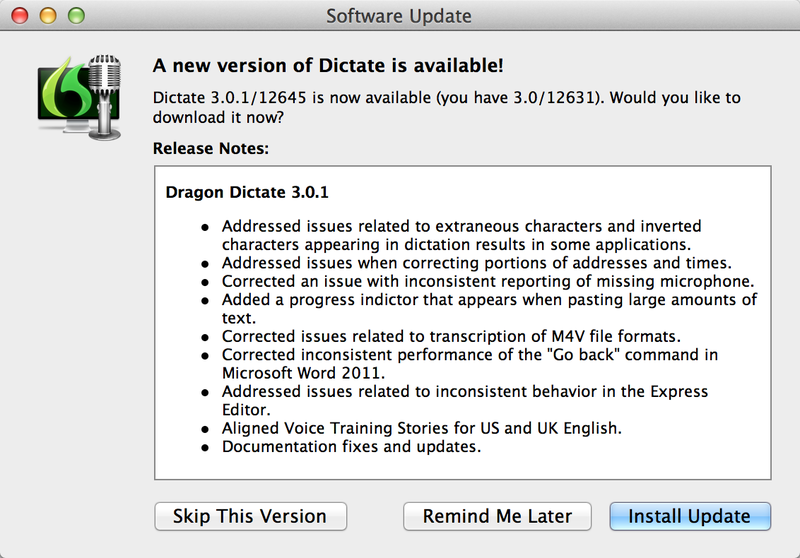 You should be auto prompted to update to this release on Dragon Dictate start up. If not and you do not have auto check for updates on (turn it on by .. Dictate > Preferences > General (tab), then place a tick in the box next to “Check for updates”). Addressed issues related to extraneous characters and inverted characters appearing in dictation results in some applications. Addressed issues when correcting portions of addresses and times. Corrected an issue with inconsistent reporting of a missing microphone. Added a progress indictor that appears when pasting large amounts of text. Corrected issues related to transcription of M4V file formats. Corrected inconsistent performance of the “Go back” command in Microsoft Word 2011. Addressed issues related to inconsistent behavior in the Express Editor. Aligned Voice Training Stories for US and UK English.